Description: A Santa Fe GP40X leads three leased Chessie System GPs up Cajon Pass in southern California. An unexpected upturn in business led the Santa Fe to lease a batch of Chessie System power in the late 1970s. Description: Three of Santa Fe's 10 GP40Xs lead this westbound which was not quite long enough to duck under itself at the Techachapi Loop. Date of photo approximate. Description: Cool shot at Summit! Description: SD45 5331 approaching Summit with eastbound manifest freight. Description: WOW! Two GP40X's. OH NO! If I would have known that was my last shot on that roll. I would have taken a different shot. 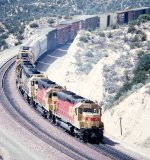 Description: One of Santa Fe's very rare GP40X.